There is something to be said about early morning baking in the silent solitude of my kitchen. When everyone is sleeping and I can be free to create without interruption. Cooking really is my zen. But I digress. I’ve been wanting to do something with the plethora of bananas that have somehow made it into my kitchen. I wanted to stray from the typical banana bread/ muffin. 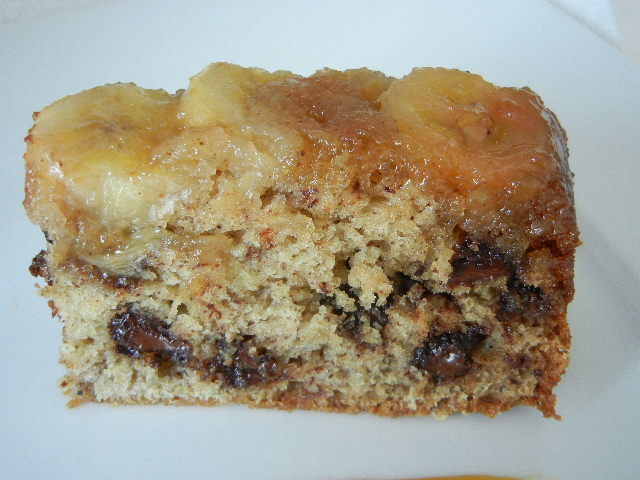 I channeled my inner David Lebovitz and made my take on his Banana Chocolate Chip Upside Down cake. It’s a relatively simple recipe. I did make a few minor adjustments to coincide with what I had in the kitchen. Instead of a banana puree, I pulsed the bananas in a food processor and left it chunky. 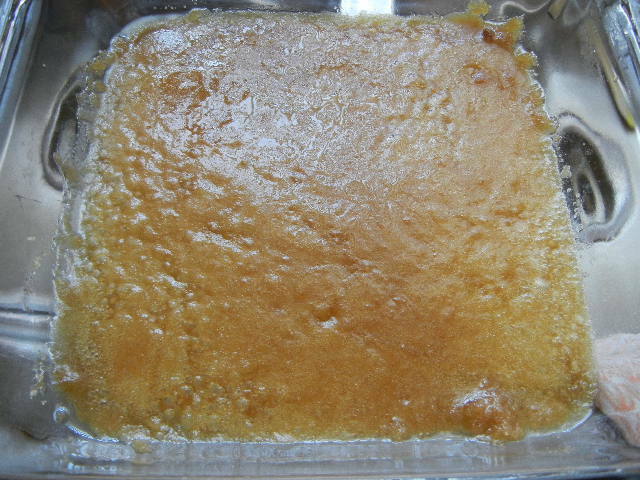 I also omitted the lemon juice and used light brown sugar instead of dark. The results were outstanding. For the topping: Place an 8×8 pan directly on the burner set at low heat. Melt the brown sugar and butter until it just starts to bubble. Set aside and let cool to room temperature. It will harden up as it cools. This is ok. It should look like this. In a small bowl whisk together the mashed banana (or banana puree), sour cream, vanilla, egg, egg white and melted butter until combined. Make a well in the center of the dry ingredients and add in the wet. Stir until just combined. Don’t over work the batter. Batter will be thick. Fold in chocolate chips gently. I wait until the cake batter is made before I slice my bananas that will ultimately be the topping of this glorious cake. 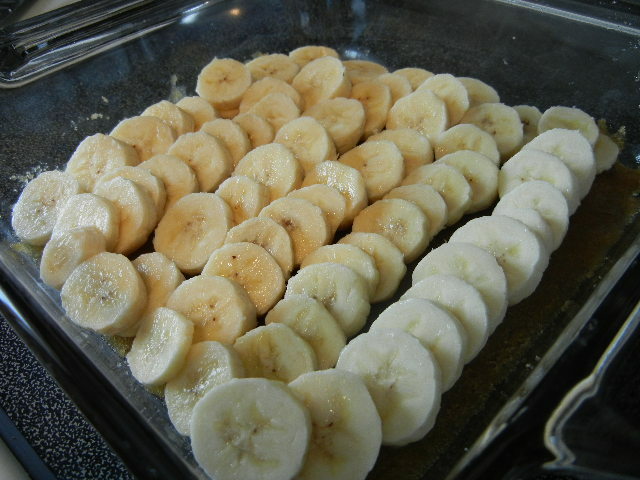 Place the bananas in overlapping rows over the cooled brown sugar/butter mixture. Spoon cake batter over bananas and spread batter evenly with a knife or offset spatula. Bake at 350 for 40 minutes or until the batter feels just set in the middle. Let cool for 2o minutes then run a knife around the edge of the cake. Turn onto a serving platter. How pretty is that? 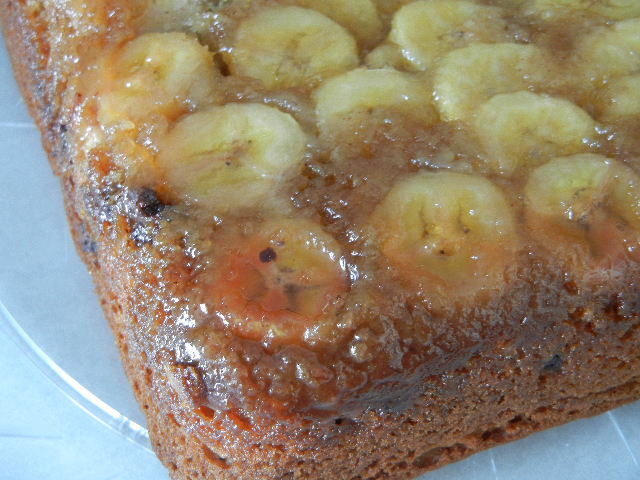 You get a dense, moist cake topped with gooey brown sugar-banana goodness. This cake is best served warm, but tastes just a good at room temperature. I think you will love this cakes as much as my family did. Thank you Dave Lebovitz!